You are here: Home » Is Craft Beer in Cans a Way to Break into the Mainstream? Is Craft Beer in Cans a Way to Break into the Mainstream? I’ve been drinking a lot of Dale’s Pale Ale lately, using it to soothe my gimpy back. Last night I found myself up in the mancave with a can of Dale’s and no glass. Now, I’m fanatical about using glassware when drinking beer, and have been known to take a bottle out of someone’s hand and pour it into a tulip for them. It may be borderline “beerdouchicus” behavior, but I hate to see good beer suffocated by its own packaging. Last night was different, because my back was pretty bad, I was already in my comfy chair, and a painful trip down and back up the stairs stood between me and a proper vessel. So I decided to rough it, and I cracked open the can and took a sip. Sure, the full bouquet of the beer was muted, but it was still a pretty tasty dose of medicine. As I sat there feeling like a mainstream beer drinker (which is the nicest way I can put it), it occurred to me that cans are a pretty mainstream vessel. Beer aficionados have long considered cans to be inferior to bottles. For many years you couldn’t find a truly “craft” beer in a can – they were for the Buds and Natty Light’s of the world, not the Sam Adamses or the Anchor Steams. This perception is changing, and beer geeks are learning that cans are actually superior to bottles in every way – light protection, ease of storage, environmental friendliness, durability, you name it. All except one: Image. 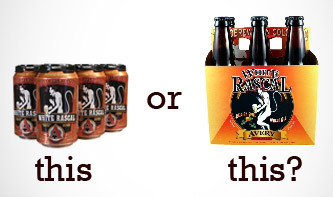 Put a can of Avery White Rascal next to a bottle of the same beer, and I bet most beer geeks would reach for the bottle. Even though we know that cans are superior, we’ve been trained that real geeks go for the glass. It’s ingrained in our psyches – fancy beers come in bottles. I’ll admit that every time I crack open a can of Dale’s Pale Ale, I feel a sense of folksy pride, like I’m a regular guy enjoyin’ a good old-fashioned ‘Merican beer. I wonder if this goes the other way as well. I wonder if folks who drink only canned beer might not try some craft selections if they’re offered in cans. These guys and gals might think bottles are for metrosexual high-falutin’ Mini Cooper drivers, not salt of the earth types like them. Nothing says “unpretentious” like a can, just like nothing says “fancy man” like a corked bottle of beer. If the price is right, they might bite. I doubt the potential mainstream appeal of cans has factored into breweries deciding to package their wares in aluminum, but I wonder if it’ll help craft beer cross over more quickly into Middle America. I guess we’ll know for sure when you can get Back in Black at Wal*Mart and we see Dale Earnhardt Jr. piloting the Oskar Blues Chevy in the Talladega 500. They’d probably sell a bunch of product then, as race fan’s would figure Dale’s Pale Ale was his daddy’s recipe! You may have a point here, Jim. Wouldn’t surprise me at all if your theory was proven correct. I did actually start seeing 21st Amendment box packs in quite a few grocery stores around here a few months ago. There’s usually two or three offerings, including Back in Black. Makes me happy. Not sure about Walmart, but Albertsons and Fred Meyers for sure. I guess we’ll see. I recall seeing lots of Bud folks drinking Dale’s and the like from cans at the lake this summer. It surprised me to see mainstream beer drinkers holding a craft beer. It makes sense (the beer is better and people like things that are better) but it was still a surprise. I DO reach for the can when it’s an option. Mostly because if I need to take 6 to the golf course or the pool or whatever, it’s nice to have that flexibility. I actually bought Avery’s Joe’s Pilsner a few weeks back JUST BECAUSE it was in the can. It helps that the local brewery here in Alabama is Good People and they only can (and keg, obviously). And theirs is good good good. I buy cans for the same reason, but what was hard for me was drinking them at home. I always felt like I was wasting a resource by NOT being at the lake, the park or whatever. But I got over that. Is it just my imagination that I can taste the aluminum when I drink it straight out of the can? Well you put your face directly onto the aluminum…probably not your imagination. I’ve got nowhere to go from there. It’s your imagination probably. Cans these days are lined, so that taste shouldn’t be there at all. Maybe you were drinking a beer with a metallic ester to it and blamed the vessel, not the brewer. If I had read more closely I would’ve realized it’s from the outside of the can. I guess I can’t believe someone who reads us would drink FROM THE CAN!! That’s why God invented plastic cups! So in other words, you’re an Idiot! Actually in those exact words! What Jim said – but you could be smelling the aluminum. Potentially. Thanks for the theory. I know realize that 1) since I pour it into a glass, it really doesn’t matter what it comes in prior to that, as long as it keeps it fresh; and 2) I can get more into the beer fridge. I will now demand cans. “Give me cans or Give me Death” seems a little melodramatic, but you get the idea. Or I “NOW” realize this. Craft beer in cans is a godsend at the beach. Bottles are a PIA! Or on a camping trip! 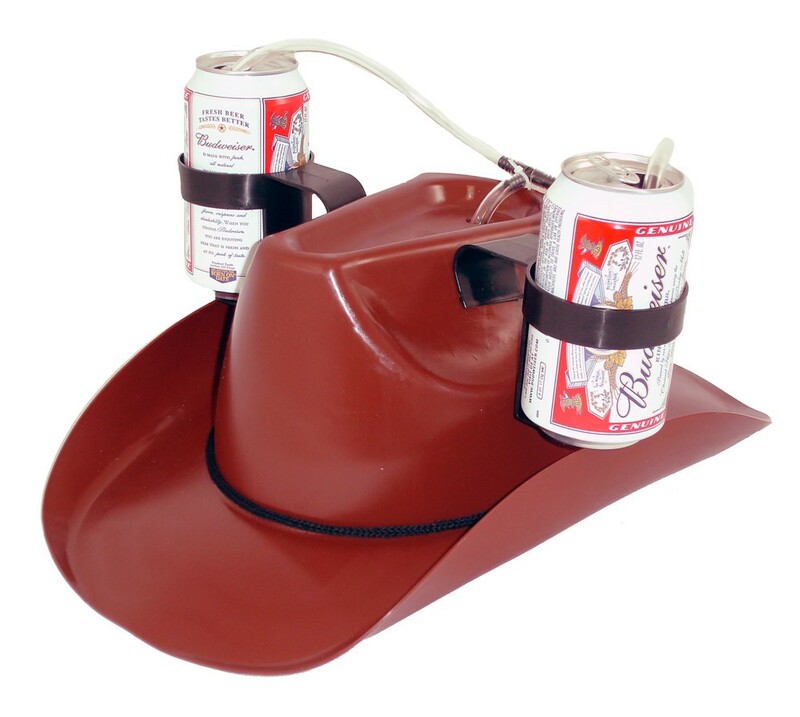 I’ll be taking some canned craft beers up into the mountains this weekend. Oskar Blues TenFidy is my favorite camping beer, given the booze to weight ratio and the fact that you can enjoy it at warmer temperatures. Love the Ten Fidy, especially at room temp! I will usually choose the canned version of a beer over the bottled version. The guy who runs my local liquor store swears that Ska Modus Hoperandi tastes better from the can than from a bottle, but I’m not quite convinced yet. DC Brau, a local beer company, pretty much only uses cans. They talk about how they are better for the beer and allowed in more places. You are allowed to bring cans into park, beaches, and other recreational facilities. Also, they keep light away from the beer better than the bottles do. Correct on all fronts. The only downside is that canning equipment is expensive. Still some small brewers like your guys and Sixpoint Ales only distribute in cans. Modus Hoperandi busted my canned craft brew cherry. I love that beer. I was somewhat leery about trying canned craft brew for whatever deep seated psychological reason but the Modus ended all of that. It was amusing the first time I drank Modus out of the can because my brain/palate/sensors were completely programmed to expect a bland lager from this type of vessel. When the hoppy goodness hit my mouth, my systems overloaded and I went into some sort of craft brew shock. It took me several seconds to process the information before I realized I was drinking an IPA. It was pretty funny but keep in mind I’m easily amused. Same thing happened with my first taste of Dales. I went from “cans are evil” to “cans are awesome” in one sip. To be completely honest, I never could stand cans. I always got that metallic taste, even when it was in a glass. I don’t know if I’m hypersensitive to it for some reason, or if it’s purely psychological, but I’ve not had canned beer in many years. All that being said, this post has inspired me to go with a couple of canned IPAs this weekend. Butternuts’ Snapperhead, and Maine’s own Baxter Brewing Company’s Stowaway IPA. Both brewery’s are can only, and my irrational aversion to aluminum has precluded me from enjoying their fine offerings, though I have had the Stowaway on draft at a beer fest in Maine, and it was fantastic. Good luck Jeff. I hope they represent how good canned beer can be! On second thought, perhaps it would be best to go with a 6-pack of one of my go-to beers (Sierra Nevada Torpedo, or Victory HopDevil…decisions, decisions), and a 6-pack of the Stowaway, since I already know it’s great on draft, so I could truly assess the whole can situation. Yeah, that’s what I’ll do. Also, if you’ve not done so, and you can find it, the Sierra Nevada/Dogfish Head collaboration, Life and Limb, would be a great one to try/review. One of my favorite beers(Young’s Double Chocolate Stout) comes in cans, so I buy it frequently. Possibly true story: A younger friend of my parents says he grew up with Dale of Oskar Blues, and that canning came along because he and his crew received a fax from a canning company while under the influence of some supposed substances… and decided to start bottling. Not sure if its true or not, but he also said that their one nut brown ale was named after a member of the Oskar Blues staff that is one ball short of a …. yea um… dudes missing a nut. Don’t forget Pork Slap Pale Ale, out of Garrattsville, NY.